Raised in Nutley, N.J., in a family with six children, Stewart developed her passion for cooking, gardening and home keeping in her childhood home on Elm Place. Her mother, a schoolteacher and homemaker, taught her the basics of cooking, baking, canning, and sewing, and her father, a pharmaceutical salesman and avid gardener, introduced her to gardening at the age of three in the family's small but orderly backyard garden. While earning a bachelor's degree in history and architectural history at Barnard College, Stewart worked as a model to pay her tuition. She was married in her sophomore year, and upon graduating became a successful stockbroker on Wall Street, where she gained her early business training. After moving to Westport, Conn., with her husband and daughter, Alexis, in 1972, she developed a catering business. Her unique visual presentation of food and the elegant recipes she created for her catered events were the basis for her first book, ENTERTAINING, published in 1982. In March 2001, Barnard College honored her with The Iphigene Ochs Sulzberger Award. 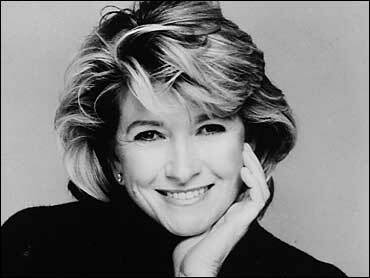 In October 2000, Vanity Fair magazine selected Martha Stewart as No. 42 in its annual New Establishment list of the top 50 leaders of the Information Age. Also in October 2000, she was named No. 274 on Forbes magazine's annual "Forbes 400" list. Three times, she has been named one of the "50 Most Powerful Women" by Fortune magazine (October 1998, October 1999, and October 2000). She was also recognized as "New York's 100 Most Influential Women in Business" by Crain's New York Business in September 1999, and one of "America's 25 Most Influential People" by Time magazine in June 1996. She has earned six Daytime Emmy Awards: "Outstanding Directing in a Service Show" for the 1997-98 broadcast season, "Outstanding Service Show Host" in both the 1994-95 and 1996-97 broadcast seasons, and "Outstanding Service Show" in the 1994-95, 1998-99 and 1999-00 broadcast seasons. The show has received a total of 36 Emmy nominations since its debut. In May 1998, Martha Stewart Living Television received the 1998 James Beard Foundation Award for the Best National Cooking Segment. In March 1998, she earned an Edison Achievement Award from the American Marketing Association. In fall 1998, Stewart was presented the HFN 1998 CEO Summit Award, and was inducted into the National Sales & Marketing Hall of Fame. HFN also named Stewart the top Lifestyle/Designer for her Everyday products in September 1999. She was named "Publishing Executive of the Year" by Adweek in March 1996, and was a recipient of a 1996 Matrix Award in the magazine category, honoring her as an outstanding woman in the communications industry. Stewart serves on the board of directors of the Magazine Publishers Association (MPA). Stewart's Web site is located at www.marthastewart.com.